Driven by innovation is the principle that marks out BRECO® Antriebstechnik Breher GmbH & Co., manufacturer of BRECO® and BRECOFLEX® timing belts. They are the most innovative producer in the field of polyurethane timing belt technology worldwide. The basis for a high-quality and reliable product is provided by wear resistant polyurethane for the belt body and high tensile steel cord tension members. The name BRECO® has become the synonym for polyurethane timing belts as a result of years of experience in the field of thermoplastic polyurethane, the development of BRECO® and BRECOFLEX® manufacturing processes and their further development.The BRECO® and BRECOFLEX® timing belts, the pulleys designed to match them perfectly and other components supplied by BRECO® reflect the breadth of experience gathered over decades by countless people who have used the products. Endless polyurethane belts are ideal for all power transmission applications where non-standard belt lengths are required. BRECOFLEX® timing belts have no joint and the helically wound steel tension members are continuous. 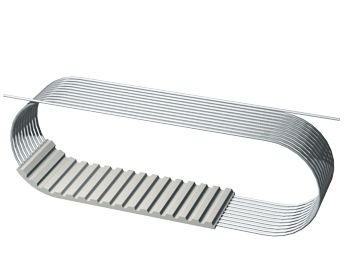 BRECOFLEX® timing belts use an innovative production technique allowing the extruded belt to be manufactured to almost any truly endless belt size, the helical tension cords being continuously wound. 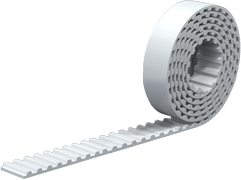 Although there is a standard range of BRECOFLEX® belts, their true strength is in their ability to be manufactured to a specific, required length, to special order. Small minimum quantities may apply depending on the length and width required, without detriment to delivery time. Open ended polyurethane timing belts are used extensively for linear drives, replacing more expensive mechanical alternatives. The extruded lengths comprise a wear resistant polyurethane toothform encasing parallel high strength steel tension cords. The reels are extruded in lengths of 50m or 100m, although special lengths and matched pairs can be made to order. Shorter lengths can be cut to order from these reels, although minimum quantities may apply depending on the length and width required. Joined timing belts are the ultimate in timing belt versatility. 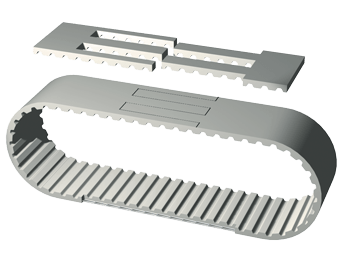 These joined belts are manufactured from lengths of Breco® M and can be used for conveying and indexing applications where long centre distances or non-standard lengths are required on a fast delivery schedule. A wide range of welded profiles and belt backings can be applied to Breco® V belts to transform them into highly specialised products. Breco® M are cropped with interlocking fingers at each end, then joined in a heat welder to provide any length of timing belt, subject to minimum length required to wrap the belt around a heat welding jig. Minimum quantities may apply depending on the length and width required.